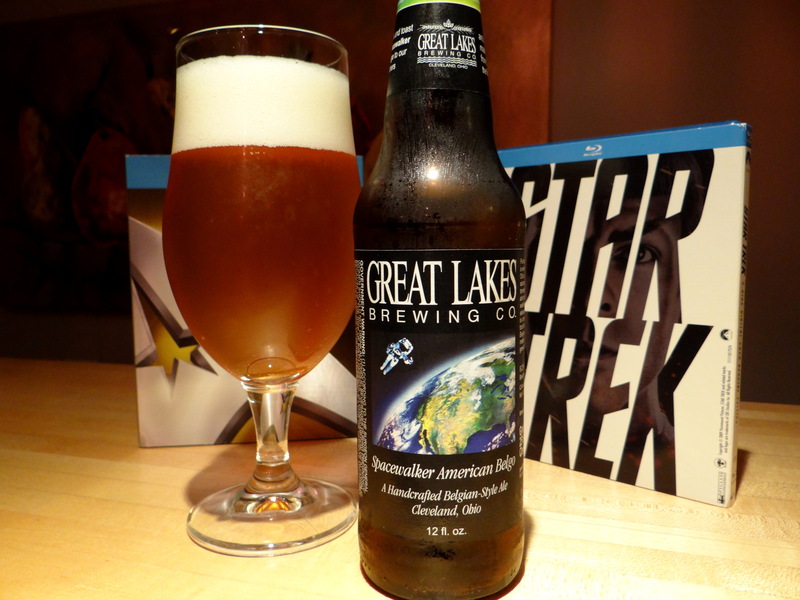 The newest release from Great Lakes is a Belgian pale ale called Spacewalker American Belgo. The names of many Great Lakes beers are taken from the pages of history (Elliot Ness Vienna Lager, Edmund Fitzgerald Porter, Commodore Perry IPA, Burning River Pale Ale, The Wright Pils, etc.) and this beer is no different. It is dedicated to the 25 courageous astronauts who have called Ohio their terrestrial home. Although in a move that will do nothing to thaw Belgian-US relations, still a little tense following the World Cup, Great Lakes makes no mention of Belgium’s three astronauts. I wouldn’t want to be in the room when they serve this beer to Frank de Winne. At this point I have to admit that growing up I wanted nothing more than to be an astronaut. That sentiment stemmed not so much from my desire to follow in the footsteps of Ohioan’s John Glenn and Neil Armstrong, but my obsession to follow a path similar to the helmsman of the Starship Enterprise, Californian George Takei. Why Mr. Sulu was my favorite figure in popular culture as a 12 year old is a complete mystery to me now. I guess characters who were different or exotic in some way appealed to me. I think it is safe to say that if I could have become a swashbuckling, Japanese-American, gay rights activist I would have been a unique figure in the small Idaho town of American Falls where I grew up (probably just one of the three would have been enough) but I digress. On pouring vigorously into a tulip glass Spacewalker shows itself to be a clear, deep golden colored beer topped with two fingers of creamy white head. Although the head is pretty modest it does leave behind pretty respectable lacing. The nose is all sweet, fruity Belgian yeasts, with banana being the easiest fruit to pick out. Based on the aroma I was expecting something of a cross between a Belgian Trippel and a Hefeweizen, but just when you think you’ve got this beer figured out you take a drink and realize that the American hops are not going to go quietly. Unmistakable IPA-like citrus notes vie with the Hefeweizen-like fruity esters for top billing in the taste receptors of your mouth. While the hops and yeast might compete with each other in the part of your brain that recognizes fruit flavors, they cooperate to produce a bitter, dry finish. Like a relationship gone bad the bitterness lingers on for longer than one would like. The mouthfeel is thick and coating suggesting more sweetness than the taste delivers. The classic Belgian Pale Ales (like Orval) use European hops that bring spicy, earthy flavors rather than the fruity and bitter flavors of new world hops, and I have to say that I prefer the old world approach. However, among Americanized versions of Belgian Pale Ales Spacewalker is one of the better offerings out there. It grew on me as my taste buds acclimated and I was quite enjoying it by the end. If nothing else it lends itself to a drinking game where everyone names a different Ohio astronaut in turn and the first person to draw a blank has to drink. If you do play that game I would advise you to avoid being the third person in the circle.